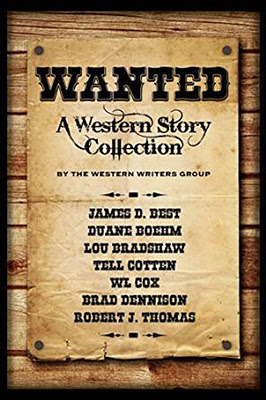 Seven bestselling western authors join forces in the time-honored tradition of the old West to deliver a collection of short stories featuring their most popular and beloved characters. Read about the adventures of Steve Dancy, Gideon Johann, Shad Cain, Lee Mattingly, the McCabes, Hunt-U.S. Marshal, and Jess Williams. These seven authors are all having a lot of success with their various western series. This collection is the perfect way to introduce yourself to some of their heroes in a set of short stories that haven’t been published elsewhere. I’ve read a couple of these writers before, most notably Tell Cotten and it was the inclusion of his story about Lee Mattingly, from his excellent Landon Saga series, that made this collection a must read for me and for readers of that series you really need to read this as we discover something about one of the main characters that may be returned to in the series. It is also quite amazing when you realize just how many books some of these writers have put out, for instance there are around forty Jess Williams stories by Robert J. Thomas. At least one of the stories seems to continue quiet closely to events in the main series but the author in question gives just enough explanation so a new reader isn’t confused by events mentioned. I’ve always believed this kind of short story collection is a great way to find new and exciting authors and this group of writers doesn’t disappoint in any way. There’s plenty of action, suspense and humour to be found within the pages and that makes for a winning combination in my opinion. I’m pretty sure most western readers will find some, if not all, these stories to be worthwhile reads and who knows, may also find themselves a new series or two to catch up on like I intend doing. After spending forty years in prison for a crime he didn’t commit, Ezekiel Cartwright has just one thing on his mind: he sets out to track down the men who set him up and then tell them, before he dies, that he has forgiven them. 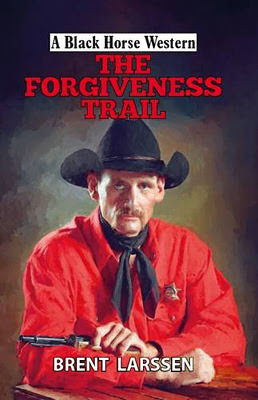 So begins one of the strangest stories of the old West; the tale of a man who set out on the forgiveness trail. Cartwright finds that forgiving the men proves a lot harder than he could have guessed and, before it is all over, he has been compelled to take up a gun again and deal with the sons of the men who so cruelly wronged him all those years ago. This is the first Black Horse Western I have read that carries the author name Brent Larssen but it is not the first I have read by Simon Webb who writes behind the Larssen pseudonym and a number of others. That I have read other westerns by this writer and still read one when I can confirms the fact that I find his work entertaining and this book is perhaps the best so far. The idea of such a badly wronged man riding to forgive those who set him up is an interesting hook by itself but the author soon has you wondering just what the sons of the men Cartwright is seeking are up to which adds another intriguing story thread to this fast moving tale. We find out just how Cartwright ended up in prison through a series of flashbacks told through not only Cartwright but the outlaws too during which we witness double-cross and some vicious killings. Cartwright’s trail doesn’t quite follow the path he expects and offers a couple of surprises, not least one about Cartwright himself. All the story threads come together in one final bloody gunfight that resolves everything neatly and perhaps not how every reader would expect and that can only add strength to this excellent tale. 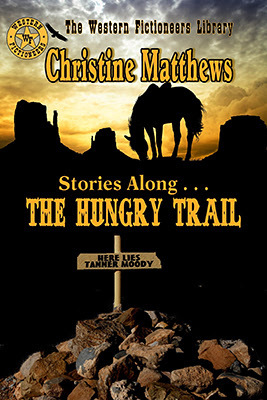 Stories Along…The Hungry Trail is a collection of eight short stories, all of which have previously been published in a variety of western anthologies. Now these tales have all been brought together in one excellent collection with a change of author name – real to pseudonym. I’d read two or three of these stories before and on the strength of those I was looking forward to reading the others. Whilst reading these extremely well written tales it soon became evident that most of these stories revolved around graves – raising the dead from them, witnessing burials and remembering how the dead came to be in them, digging into them to steal from the remains and offering an idea on how the dead filling the many graves marking endless trails came to be there. Filled with fascinating characters these stories provide gripping reading and even though I’m not normally a fan of cross-genre tales I really enjoyed the two that combined western and supernatural elements, one of which was possibly my favourite in the whole collection. The eagle-eyed amongst you will have noticed the cross on the front cover inscribed with the name Tanner Moody, and for those who have read the book The Funeral of Tanner Moody (written by a variety of different authors) you might like to know that two of the stories in this collection feature him.